Set in the Parisian underworld of the early nineteenth century, Les Misérables follows the adventures of Jean Valjean, once an honest peasant, who spent nineteen years in prison for stealing a loaf of bread to feed his sister’s starving family. A hardened and bitter criminal upon his release, Valjean is transformed when an act of compassion by a priest he robbed saves him from returning to prison. Changing his identity and his ways, Valjean becomes a successful industrialist and eventually the town mayor. Taking compassion on the poor, he raises the orphaned daughter of a prostitute as his own, never telling her of his shady past. Yet he is haunted by it, still pursued relentlessly by the police inspector Javert, who does not believe in moral redemption. When Valjean’s daughter, Cosette, falls in love with a young revolutionary, Javert concocts a plot to catch both the lawless peasants and the elusive Valjean once and for all. Full of suspense, romance, and powerful social commentary, this sweeping epic became the gospel of the oppressed and is widely considered one of the greatest French novels of its age. If you have heard this is one of the great books in Western Literature, you have heard correctly. It is a wonderful story, elegantly, touchingly told. It is also at least three hundred pages too long. Hugo goes into frequent diversions: forty or more pages on the Battle of Waterloo, a history of nunneries, an agonizing history of the sewers under Paris. He uses in all these examples (and more) four or five thousand words where one hundred or less would have been more than sufficient. Still, nobody who loves good literature, and especially anyone who loves good storytelling, must not miss this book. It is beyond belief magnificent. By the way, the musical is also wonderful, but both the book and musical are examples of art at its best: neither should be missed. Fantastic after getting used to Frederick Davidson. It took awhile for me to adjust to Frederick Davidson as the narrator. After that it was fantastic. Don't read the abridged versions. There is some tough slogging through the political ramblings, but in the end it's worth it. The full story, unimaginably vast for a work that takes place in small apartments and dingy taverns, complete with long deviations detailing historical references, and cataloging the caste of human society of the middle 1800's in the "centre" of the world. This work has a crisp narration, clear and full bodied. The various sprinklings of French that could not be translated (Names mostly) are spoken with clarity and fluidity, and although numerous, have enough association with other elements of the story that they are not lost to the listener. A superb listen, great story, old enough to be classic, new enough to shed light on our contemporary culture. 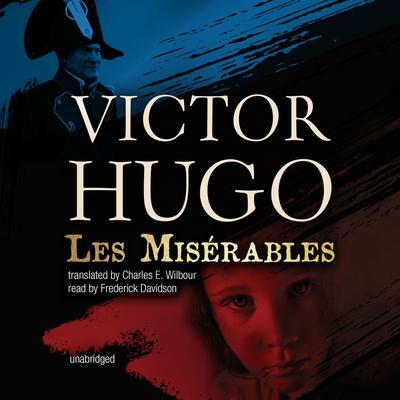 Les Miserables is well known mostly because of the musical version, but the book is so much more (in fact, the editing job they did to make the musical coherent is really quite a feat!). Mr. Davidson hits exactly the right tone of sardonic humor and pathos to make Hugo's text sing to an English-speaking audience. His voices are marvelous and his French sublime. Oddly, once in awhile you can hear birds chirping in the background (!) but that actually added to some of the scenes. I've found the book and Mr. Davidson thoroughly delightful. Action, romance, brilliantly crafted characters, an epic story, redemption, the pursuit of justice—this book has it all. Yes, it may, at times, get bogged down by political diatribes and a detailed description of Paris’ sewer system, but please do not let that stop you from giving this book a try. It is a great story, one of my favorites, and the only book that has, to date, made me cry. And not in a bad way. I was just that enraptured in the story. The one thing I’ll say specifically about the audiobook version is that Frederick Davidson has a weird narration style. It sounded like he was trying to parody a snooty British person. But that aside, two thumbs up.